The WooCommerce Product Table plugin comes with over 50 features, and we’re constantly adding new ones in response to our customers’ feedback. Combine them in 100’s of different ways to create unique tables listing your store’s products. Add product tables anywhere on your site – Simply choose your default options on the plugin settings page and click the ‘Insert product table’ button to add product tables to any page. Create multiple tables – Use the shortcode options to create multiple product tables, each with different products and settings. Choose which columns appear in the table – the plugin supports columns for SKU, ID, name, description, short description, date, categories, tags, image, reviews, stock, weight, dimensions, price, add-to-cart, plus a button linking to the single product page. If that’s not enough, then you can also create columns listing attributes, custom fields or taxonomies. Customizable column headings – you can change the column headings to anything you like, or remove them completely. Quantity selector – Show or hide the quantity picker so that customers can choose a quantity directly in the product table. 3 types of add to cart button – Choose whether the add to cart column includes a standard add to cart button, multi-select checkboxes, or both button and checkbox. Change the ‘Add Selected to Cart’ button location – Position the button above or below the product table, or both. Customizable add to cart button – WooCommerce Product Table integrates with our free WooCommerce Custom Add to Cart Button plugin. Use this to customize the wording of the add to cart buttons in table, or replace the text with a cart icon. Change the button wording – If you’ve included a button column linking to the single column page, then you can rename this to anything you like. Ajax cart option – Control whether or not the page reloads when customers add products to the cart. 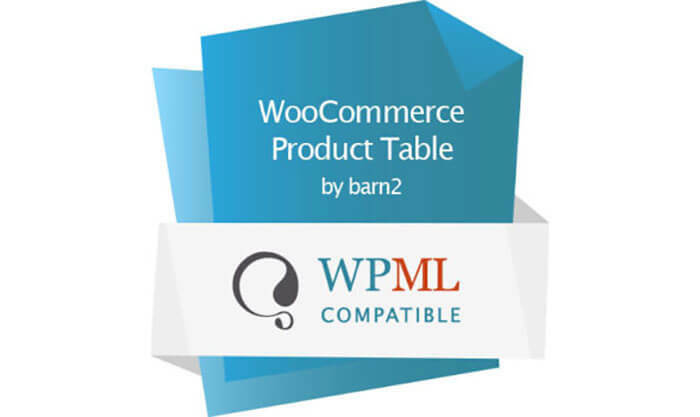 Integrates with the official WooCommerce Add-Ons plugin – Use WooCommerce Product Table with WooCommerce Product Add-Ons to add other types of option to the product table, including text entry fields, checkbox options and radio buttons. List specific products based on category, tag, status, date (based on day, week, and/or month), custom taxonomy term, or custom field value. Include or exclude specific products based on their ID. Exclude entire categories from the table. Column widths – Override the default sizing and control the width of each column. Rows per page – Control the number of products shown on each page of the table. Product limit – Set a maximum number of products that can appear in the table. Set the date format – Choose the format for any date columns. Specify date columns – If you’re using extra columns such as custom fields to display dates, use this option to ensure that it is sorted correctly in date order. Useful for listing events in the table. Multiple sort options – Control how products are ordered when the table first loads, and the sort direction. Clickable column headings – Customers can also click on a column heading to sort the table. Keyword search – Display an instant search box above the table. Pre-search the table – Filter products based on a specific search term when the table first loads. Filter dropdowns – Add multiple filter dropdown lists above the table. Choose from categories, tags, or any attribute or custom taxonomy. Filter widgets – The plugin comes with its own version of all the core WooCommerce filter widgets. Includes active filters widget, attribute, price slider and rating widgets. WOOF WooCommerce Products Filter – Also integrates with the WOOF WooCommerce Products Filter plugin (see tutorial). Customizable column filters – Choose whether clicking on a category, tag or custom taxonomy in the table will perform a filter or load the relevant archive page. Show, hide or position elements such as the search box, reset button, page length dropdown, product totals, and pagination buttons. 4 types of pagination buttons – Choose from 4 different styles to let customers navigate between pages of the product table. Customizable ‘no products’ messages – Change the text that appears when there are no products in the table, either when it first loads or after the customer performs a filter. Image size – Control the size of the product image in the table. Image lightbox – Choose whether customers can click on an image to view a bigger version in a lightbox. Audio & video – The plugin supports embedded audio files, video and media playlists. Customers can watch or listen to multimedia content directly in the product table. Description length – Set the length of the product description in the table. Shortcodes & HTML formatting – Choose whether or not the table will display content generated by other shortcodes, such as buttons, hyperlinks or embedded audio and video players. Links – Specify which columns are clickable to the single product page, or disable all links. 100% responsive – The table is fully responsive and will automatically adapt to fit different screen sizes. Priorities option – Control which columns to hide when there are too many to fit on the page. Column breakpoints – Use fine-grained control over which columns to show or hide on different devices. Responsive control – Control the + icon which customers click to view hidden columns. Responsive display – Choose whether to show or hide hidden columns by default, or whether to open them in a modal window. Built-in caching – Enable the cache option to decrease load times even further. WPML – The plugin is officially certified as WPML compatible, ideal for multilingual sites. Wrap – Choose whether columns with multiple lines of text are truncated onto a single line, or wrapped onto multiple lines. Footer visibility – Decide whether to include a footer row in the table, repeating the column headings. Scroll offset – If you have a sticky header, then you can change the height that the page scrolls back up to when customers navigate between pages in the table. Numeric terms – Allows you to use numbers instead of words for your categories or taxonomies.